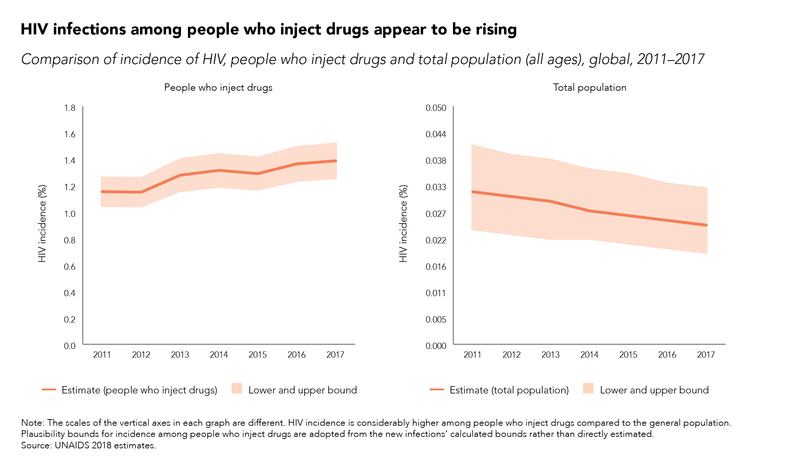 While the incidence of HIV infection globally for all ages declined by 22% between 2011 and 2017, HIV infections among people who inject drugs appear to be rising. HIV incidence—the number of new HIV infections among a susceptible population during a certain time—among people who inject drugs rose from an estimated 1.2% in 2011 to 1.4% in 2017. There is compelling and comprehensive evidence that harm reduction—including opioid substitution therapy and needle–syringe programmes—prevents HIV infections among people who inject drugs. However, criminalization of drug use and possession for personal use and the widespread stigma, discrimination and violence faced by people who use drugs hampers access to health and harm reduction services. In its new report, Health, rights and drugs: harm reduction, decriminalization and zero discrimination for people who use drugs, UNAIDS has outlined a set of recommendations for countries to adopt for a public health and human rights response to drug use.